***Disclosure: This is a sponsored post in partnership with Dunkin' Donuts. I was provided with product to help facilitate this posting. No monetary compensation has been received. Love is in the air at Dunkin’ Donuts, and the brand is offering several fun and heartfelt ways to help celebrate the season. Dunkin’ Donuts is launching today an online contest, “Dunkin’ Hearts Love,” to give engaged couples the chance to win a $10,000 wedding present. In addition, to help guests show their love in creative yet simple ways, Dunkin’ Donuts is offering two varieties of heart-shaped donuts (pictured in the video above) perfect for any Valentine’s Day celebration, love-inspired Snapchat filters and mGifts, virtual Dunkin’ Donuts cards, to send the gift of Dunkin’ to a loved one from a mobile phone. 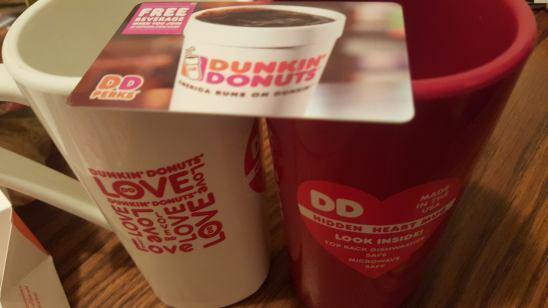 · Dunkin’ Hearts Love Contest: Dunkin’ Donuts is putting the DD in Wedding, engaging fans with a contest that gives engaged couples a chance to win $10,000 in cash as an early wedding gift. As part of the “Dunkin’ Hearts Love” contest, anyone planning their wedding between today and December 31, 2016 can visit a special website between February 11 and February 18 to share their sweet story of how their sweet heart proposed. One lucky couple will win the $10,000 grand prize. To enter, and for rules about the contest, please visit http://DDHeartsLove.com. · Valentine’s Day Snapchat Filters: Dunkin’ Donuts fans can show a lot of heart via the brand’s new Snapchat filters, featuring Dunkin’ Donuts’ heart-shaped donut designs and sweet sayings such as “Donuts About You.” The Valentine’s Day themed geofilters are the latest addition to Dunkin’ Donuts lineup of seasonally themed filters and will be available for sharing the love with friends and followers for fans in or around a Dunkin’ Donuts restaurant. · Send the Gift of Dunkin’: Dunkin’ Donuts mobile gift cards are available in four varieties of Valentine’s Day themed designs, including one with heart-shaped donuts as roses and another that reads, “You are the Turbo Shot to My Heart.” Dunkin’ Donuts mobile gift cards can be purchased through the Dunkin’ Mobile App or DunkinDonuts.com. The Dunkin’ Mobile App also allows guests the option of sending cards to anyone via text, email or Facebook Connect. Throughout February, Dunkin’ Donuts is serving two varieties of its beloved heart-shaped donuts. Brownie Batter Heart Donut (my fav!) is a heart-shaped donut with brownie batter flavored buttercreme filling, topped with chocolate icing and heart sprinkles. The Cookie Dough Heart Donut is a heart-shaped donut with cookie dough flavored buttercreme filling, topped with chocolate icing and chocolate chips. Perfect for large parties or that special someone, these two scrumptious seasonal treats are available at participating Dunkin’ Donuts restaurants nationwide. The perfect complement to a heart-shaped donut is Dunkin’ Donuts’ Caramel Macchiato, a handcrafted, layered espresso beverage. Two shots of Dunkin' Donuts freshly-brewed, rich espresso are poured over steamed milk swirled with a sweet caramel flavor. All Dunkin’ Donuts espresso beverages are made with espresso beans that are 100% Fair Trade Certified™ and selected from the finest, high-quality Arabica beans. Duknin' Donuts has also provided us these cute mugs along with a $10 gift card in each for two of our readers. Each winner will win one mug along with a $10 gift card to Dunkin' Donuts. 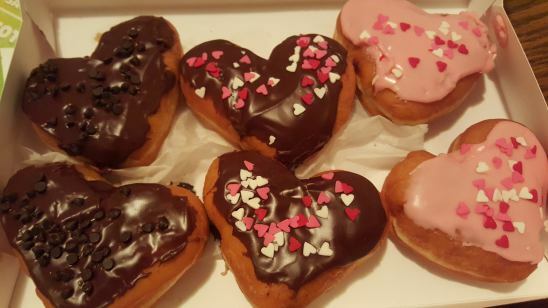 All you have to do is follow and reply to us on any of our social media outlets and tell us who your Valentine is that you would be sharing these special donuts with. We will put all names in a hat and the kids will draw two names on video announcing the winners. Giveaway will end Saturday, 3pm PST. Have fun and Happy Valentines Day! (You can find us on Instagram, Twitter, Pinterest, YouTube and Facebook. Founded in 1950, Dunkin' Donuts is America's favorite all-day, everyday stop for coffee and baked goods. Dunkin' Donuts is a market leader in the hot regular/decaf/flavored coffee, iced coffee, donut, bagel and muffin categories. Dunkin' Donuts has earned the No. 1 ranking for customer loyalty in the coffee category by Brand Keys for nine years running. The company has more than 11,700 restaurants in 43 countries worldwide. Based in Canton, Mass., Dunkin' Donuts is part of the Dunkin' Brands Group, Inc. (Nasdaq: DNKN) family of companies. For more information, visit www.DunkinDonuts.com.